In a large soup pot, combine the soy sauce and dashi powder with 6 cups of water and bring to a simmer. In a large saucepan of boiling salted water, cook the soba until al dente. Drain well. In a large nonstick skillet, heat the oil. Add the pork and mushrooms and cook over high heat, stirring occasionally, until the mushrooms are lightly browned and the pork is no longer pink, about 5 minutes. Add the shrimp and cook, stirring occasionally, until curled, about 3 minutes. Add the cabbage and cook just until wilted, about 1 minute. Scrape the mixture into the soup pot. Add the noodles and simmer just until heated through, about 1 minute. 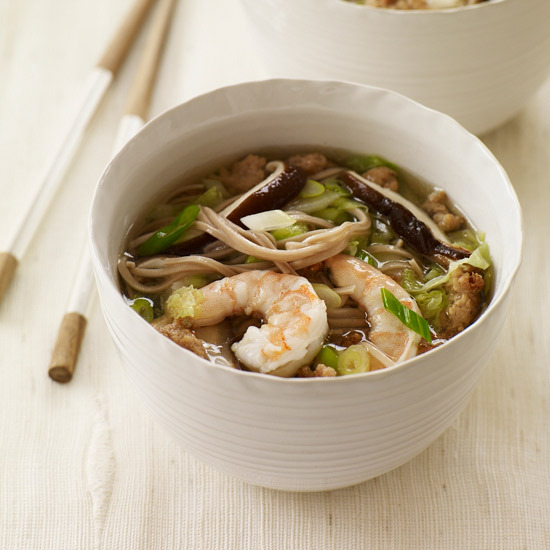 Serve in deep bowls, garnished with the scallions. Dashi is a clear Japanese stock often made with dried bonito (tuna) flakes and water. It's available in powdered form at Asian markets. In place of the dashi and water called for above, you can use 3 cups of low-sodium chicken broth mixed with 3 cups of water. Sake Dry, earthy Shichihon Yari Junmai. Pairing by Rick Smith and Hiroko Furukawa of New York City's East Village sake shop Sakaya (sakayanyc.com).